Day 1: Arrive early morning in Buenos Aires on LAN flight from Miami. Spend day wandering around San Telmo, visiting several churches and Plaza de Mayo. Day 2: Take the free city tour by bus around Buenos Aires. The tour wasn’t very good but it ended in Belgrano so we had we a good lunch in Barrio Chino. Actually, the bus trip back to San Telmo on the 29 was a much better tour of the city. Day 3: A day of fog and walking…wandered around Puerto Madero, saw a good exhibition of Molina Campos works at UCA, walked around the microcentro. Since it was Thursday we headed to Plaza de Mayo to see the Madres. Then pizza for lunch followed by a stroll down Av de Mayo to Congreso. After that it was a hike over to Abasto where I left the girls on their own to do some shopping while I attended a book reading group. Afterwards we took the subte back to San Telmo. This was a long day. Day 4: Recoleta cemetery, then over to Bellas Artes, then over to see the Flower, then the 17 bus home. Day 5: I collapse with the flu! The girls spend the day in San Telmo. Day 6: I stay in bed while everyone else heads out on Sunday to the Feria de Mataderos. Day 7: I remain ill, so the girls explore La Boca then take a taxi over to do some shopping on Florida street and explore Plaza San Martín. Day 8: This was a Tuesday and I have forgotten what happened this day, probably more shopping and exploring by the girls on their own. My flu is slowly getting better. Day 9: The girls go to the zoo with Ceci’s mom. (I’m still under the weather). They really liked the zoo. Day 10: I stay home resting while the girls go shopping in Once with Ceci. In the evening they go to a folclore concert with Ceci’s parents. Day 11: The girls take the ferry to Colonia for a day trip. I stay home resting for the weekend. Day 12: I’ve recovered from the flu and we board the bus to Iguazu Falls. Day 13: Arrive in Iguazu, spend the afternoon exploring the Argentine side of the park. Day 14: A full day in the Argentine side of the park at Iguazu Falls. Day 15: Take a bus over to the Brazil side of the park, view the wonderful panorama of the falls from the Brazil side, then head back across the border, then board the bus for the overnight trip back to Buenos Aires. Day 16: Arrive back in Buenos Aires, a rainy day so we just stay home resting. Late in the afternoon, while I’m sleeping, the girls head out and visit the national history museum next to Parque Lezama. Day 17: The final day. It’s sunny, thankfully. We hop on the 39 and I take them to El Ateneo on Santa Fe, then we walk around Recoleta, wandering down Av Alvear seeing the fancy buildings, then cross over 9 de Julio. Visit the Isaac Fernandez Blanco museum, wander around Plaza San Martín, stroll down Florida street, cross Plaza de Mayo, then walk down Defensa back home. Have a late lunch at a restaurant next to Parque Lezama then it’s time to take the taxi to Ezeiza. Traffic to EZE is horrible but we make it on time and they fly off to the U.S. It was a fun trip. It was the first time that my sister or the twins had ever been outside of the U.S. They seemed to have really enjoyed it. I wish I didn’t get sick but they managed fine on their own. Fortunately, I recovered enough to go to Iguazu with them. Their visit reminded me just how much there is to do in Buenos Aires. My sister and her daughters are in town visiting for a while. Yesterday they were wandering along Florida street and brought some cookies back to the apartment. After looking at the label I realized that the cookies were by fellow BA blogger, Frank of Sugar & Spice. We had the oatmeal raisin cookies…superb! If you haven’t tried these cookies, then go find some. Meanwhile, read the interview that La Nación recently did with Frank. A new blog about William Henry Hudson points to a nice article in The Christian Science Monitor: William Henry Hudson, “A Revival of Argentina’s Thoreau”. Confusion about Hudson’s nationality is understandable. He was himself confused. Argentine born, the child of Anglophile immigrants from Massachusetts, Hudson thought he was destined to be an Englishman. He would be that, and much more. Through his writings and civic efforts to create laws to protect birds and other animals, he fiercely rejected the biblically sanctioned notion that the natural world was man’s to conquer and dispose of at will. His was a voice in the wilderness which, like that of Henry David Thoreau, was actually heard. Were he to be writing today, he’d surely find an audience in the green movement. Hudson artifacts are displayed in the three-room house: his watch; a sketch for the William Rothenstein portrait of Hudson that hangs in London’s National Portrait Gallery; and rustic touches that recall his naturalist activities: ostrich eggs, a puma skull, the skeleton of an armadillo, the clay nest of the peculiar oven bird. A painting of a bird, donated by the Japanese city of Yokohama, recalls Hudson’s link to Japan, established by the marriage of his grandniece, Laura Denholm Hudson, to Yoshi Shinya, the first Japanese immigrant to Buenos Aires. Their child, Violeta Shinya, became the first director of the museum, in 1964. Hudson’s books reached Japan late in the 19th century, and were included in the curriculum when the study of English was instituted in the schools. I’ve been to the small town of Hudson but, somehow, missed the house where he was born that is now a museum. Again, here’s the link to the new blog about the place: Parque Ecológico Provincial Guillermo Enrique Hudson. I definitely must go to Hudson again….field trip! A good friend of mine from college, David Román, is currently visiting Argentina. David is an environmental lawyer who teaches at the University of Puerto Rico. He’s down here with about twenty students and colleagues from the university to attend a conference on geographic information systems. (More on that conference in another post). On Monday morning I met up with David at the Lafayette Hotel, where his group is staying. BTW, that appears to be a fairly nice hotel for those of you who might be searching for a good hotel to stay at in downtown Buenos Aires. It’s not in my favorite location but you are right downtown. As everyone in Buenos Aires this week knows, this has been an usually cold week. As I was walking to the hotel Monday morning, all bundled up in my Gloverall duffle coat, gloves, scarf, and cap, I encountered many other people shivering their way across Plaza de Mayo. I spent some time meeting the members of David’s group, all very nice people. But, they were all extremely cold from the weather, asking what there was to do indoors. Unfortunately, most of the museums are closed on Monday but I recommended Malba, which I knew to be open, and a few other things. And I understood why they were so cold. Having lived in Miami for 5 years, I got acclimated to the tropical weather. 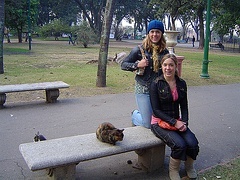 My first winter in Buenos Aires was torture. And, of course, Buenos Aires doesn’t really have a real winter, more of a cool autumn, but when from you’re from Puerto Rico or Miami then it’s mighty cold here. Winter in Miami rarely gets below 55 F but even at that you would see people breaking out the winter parkas, wool caps, and gloves! It was quite a sight. Anyway, the Puerto Rican contingent is in for even more cold weather. Their travel agent planned a post-conference trip to Patagonia. This weekend they leave for Ushuaia and then to Calafate. I’m not sure what the travel agent was thinking about when sending a group of people from the tropics to the deep end of Patagonia in June. But the group is very excited anyway. David needed to buy some warm clothing, so I took him out to Abasto for some shopping. The travel agent had wanted to bus the entire group out to the mall in Martinez, but that’s not really a good way to spend a day when your time in Buenos Aires is limited. So, instead, we did some shopping at Abasto, went to Malba, walked around Palermo and Recoleta, then finished the day with submarinos at La Biela. David wanted a pair of “long johns” to stay warm while in Patagonia and long underwear is difficult to find in Buenos Aires. Of course, since it doesn’t really get that cold, then it makes sense. (One store clerk started laughing when David said he was going to Ushuaia next week). We only found a few pair in stores that sold ski clothing. Back in Tennessee you can just drop into a Dollar Store and find a pair. The travel agent did arrange for the group to attend a tango show at Esquina Carlos Gardel, which David reported was entertaining. The travel agent also wanted to take the group to a gaucho dinner show but I talked David out of that one. Tango shows are bad enough but a gaucho dinner show in Buenos Aires sounds almost as bad as the Dixie Stampede. Instead, the group followed my advice and had dinner at Chiquilin. On their first night in town, the group had dinner at one of the overpriced Puerto Madero restaurants. David said the steak, 27 pesos, was like something from Burger King. But he called me Thursday and said that they really liked Chiquilin where they had a great time. He told me that there is now a Puerto Rican flag hanging in the restaurant. Now, I have to go to Chiquilin just to see the flag. David told me to tell the waiters that I know the Puerto Ricans; he assured me that the waiters will remember them. I’m glad my Puerto Rican friends had a good time in Buenos Aires. This actually was David’s second visit to the city. The last time I saw him was in Puerto Rico where we talked about Buenos Aires. I always will remember that he described the women of Buenos Aires as European with a Latin twist. I’m wishing the Puerto Ricans warm thoughts and safe passage as they journey through Patagonia in June. Update: David called me this afternoon from Ushuaia. He reported that the weather down there wasn’t too bad. He actually used the word “mild”. I just checked the weather service and the high temperature on Monday is 8 degrees Celsius. So, it looks like they got lucky on this one. (I see that the temp is dropping later in the week to a high of 1 celsius). But by that time they should be in Calafate. I guess traveling in Patagonia this time of year is rather hit-or-miss with the weather: bitter cold to perhaps not so cold, but it’s probably best to be prepared for the worse. David did say that Ushuaia right now is absolutely beautiful and that the group is having a great time. David called me on Monday and I was surprised to hear that he was in Buenos Aires again. Due to the fog hanging over Buenos Aires this past week his group was stranded in Calafate for 4 extra days. The Puerto Ricans were not happy campers, having to hang out in frigid Calafate in June. They missed the Mendoza part of their trip entirely while waiting to be rescued from Calafate. (Their flight from Calafate was scheduled to go to Buenos Aires and then to Mendoza. I was surprised that Aerolineas doesn’t fly directly from Calafate to Mendoza). At one point they asked about taking a bus out of Calafate but were told that it was a 48 hour ride from Calafate to Buenos Aires. I think it was then that they truly realized they were in the depths of the world. I wonder how many dreamed of salsa and dancing on the beach under the swaying palms.